Until further notice, the amount of Harris County’s down payment assistance for new and pre-existing homes is up to $23,800.00. The maximum purchase price for a pre-existing home is $200,000.00. The maximum purchase price for a new home is $228,000.00. Effective May 25, 2018, the pre-existing homes must be built post 1978. With the rising cost of homes in Harris County, the implementation of this change will allow more homebuyers to meet the required 39% front-end-ratio and 42% back-end-ratio. A homebuyer that needs an amount over $14,999 to meet the front and back-end-ratio will incur an increase in their affordability period from (5) years to ten (10) years. 3-Year Home Warranty on all pre-existing homes – Maximum of $500.00 per year. One (1) Year Flood Insurance Policy – Maximum Policy $500.00. To participate in this program, you must live in the new or pre-owned house for a minimum of five years. A homebuyer that needs an amount over $14,999 to meet the front and back-end-ratio will incur an increase in their affordability period from (5) years to ten (10) years. Your income is not totally determined from your paycheck. It is also determined by use of your checking, savings, investment, and retirement accounts at a rate of point six percent (.06%), plus any other forms of income you might receive, such as child support, reoccurring gifts, etc. How much can you afford to spend on a home? Providing the information below will allow you to calculate how much you can afford to spend on a home. However, many additional factors play a part in the loan qualification process. To calculate how much you can afford to pay for a house, click here. The Harris County Community Services Department’s (CSD) Downpayment Assistance Program (DAP) can assist you financially with purchasing your dream home, in Harris County, Texas, if you are income eligible and a first-time buyer. For more information about the DAP: Steps to Homeownership, click here. 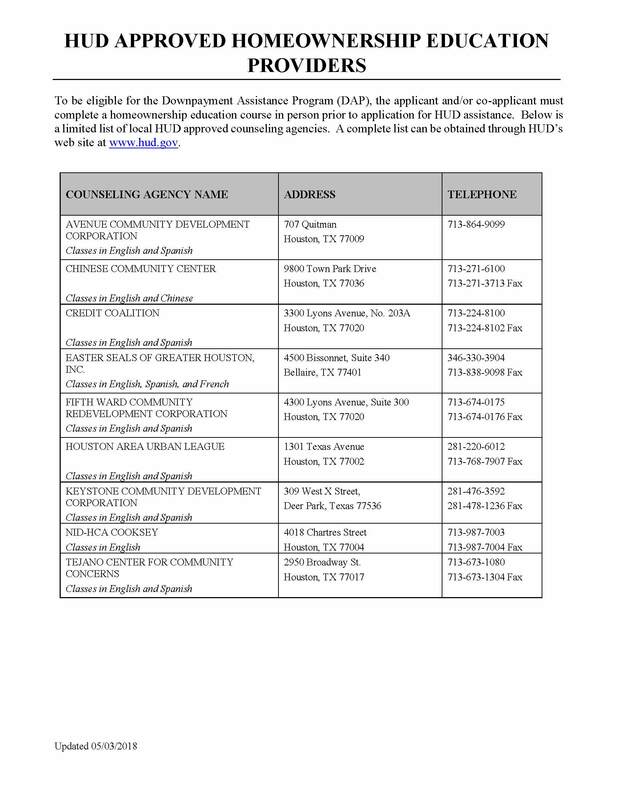 For the City of Houston’s Homebuyer Assistance Program (HAP), please click here. For the City of Houston’s Workforce Housing Downpayment Assistance Program (WHDAP), please click here. Ask about purchasing land and other VA programs. For a county map that covers the area served by Harris County’s DAP program, click here. Email your comments and questions to the Harris County staff. Copyright © 2019 Harris County. Powered by WordPress. Theme: Esteem by ThemeGrill.